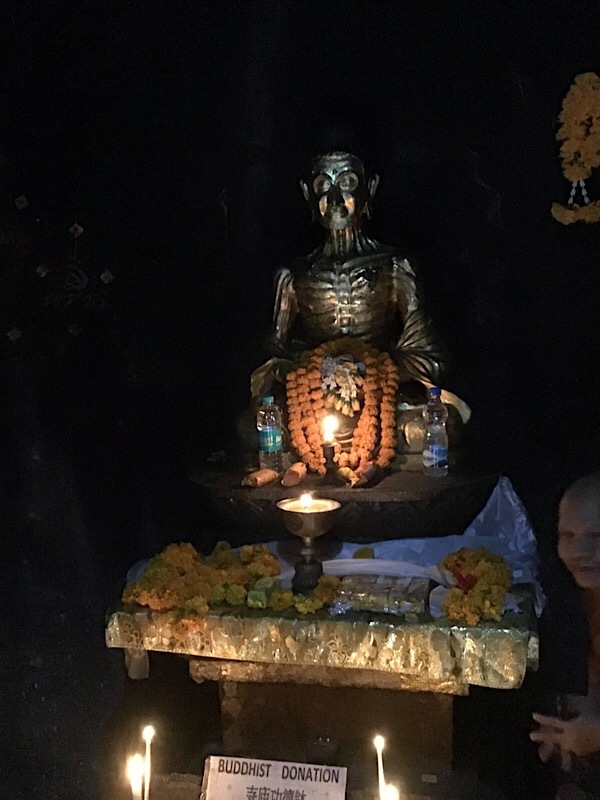 On our road to Varanasi, a holy city where people take sacred baths in the Ganges, we stopped at the caves where the Buddha is supposed to have trained his asceticism. It was a long walk up and quite busy. Young boys with motocycles where driving up and down, hoping they could make some rupees by carrying tourists. In the typical Indian way they honked their horns continuously for us to get out of the way. That gets on your nerves before you know it. The caves were very small and there were a lot of people wanting to see them. The Shri Lankans alway get very patiently in a long queu, while others pass them by. 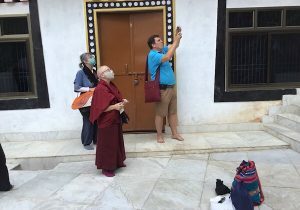 They give a good example of Buddhist patience. 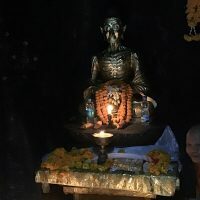 In the caves we found statues of an extremely emaciated meditator. There was no room for us to sit and do our prayers on the spot, but the lama found a spot where the prayer flags could be hung. 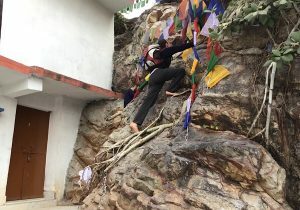 Under her guidance one of our young and enthusiastic pelgrims dared to climb the rocks with bare feet. Which I consider quite brave, for going up is still possible, but going down could hurt a lot. Fortunately he came down without wounds and we could continue our trip to Sravasti. I was lured into giving cookies to the enormous row of beggars and children. Special boxes with a hundred small packages were prepared so I could give a hundred cookies. But during this the other boys with cookie boxes started to press their boxes under my nose. This became a real ordeal. It took me about 15 minutes to distribute all these packages while children were screaming and cookie sellers were harassing me. Finally I had to pay 1300 rupees, which is a considerable amount here. While walking away, relieved, one cookie boy kept telling me I had to buy his cookies. That was one bit too much and I turned out shouting at him thatI did not want to buy his cookies. This was after I told him at least ten times that I didn’t want to buy his cookies. That is India for ya. 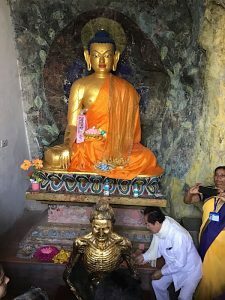 Although we did not walk like the Buddha on this pilgrimage, I can assure you that trveling by car through India is no picknik. The roads are horrible and it took us from 8 in the morning till 19:30 at night to travel the 260 kilometters between Bodhgaya and Varanasi.